Before start any discussion about the stratigraphy, it is necessary to draw a historical frame of the excavating works which took place inside the cave, in order to present the sequence of the events which allowed the extraction of the scientific data hidden in its sediments. As formentioned, the first fossils found, were two animal teeth, which were sent by the Petralona Community to the Thessalonica University. During the following explorations of J. Petrocheilos (1959b, 1960a) several bones were also collected, but the exact number, the discovery site and their present whereabouts, remain unknown. The next procedures were promoted by the University of Thessalonica, judging from the Introduction of the 9th volume of the Institute of Geological and Underground Research (I.G.U.R). The General Director Dr. K. Zachos (1964) quotes: "After the discovery of the Palaeoanthropus skull... studies and systematic excavations of the cave were conducted by the University of Thessaloniki and the so extracted material was elaborated by A. Kanellis... Moreover, the Hellenic Spelaeological Society is continuing its research in this interesting cave. During 1962 G. Marinos Professor of the Geological Department of Thessaloniki University and member of the Council of I.G.U.R. continued the excavations in the cave... and entrusted the studies of the fossils to the specialist of the Pleistocene mammals, Professor O. Sickenberg, of the University of Hanover". The realization of the excavations also confirms Sickenberg (1964) and Marinos (1965). Contrary to Zachos (1964), Sickenberg (1964) indicated that they had been conducted by Prof. A. Kanellis and P. Kokkoros, while Marinos (1965) himself stated that it was J. Petrocheilos who explored the cave by a series of excavations. Despite of the above contradictory statements, J. Petrocheilos, P. Kokkoros, A. Kanellis and G. Marinos never mention in their works any systematic excavations. According to the present evaluations it is not quite clear what exactly occurred during the years 1959-62, although the issue presents particular interest, especially regarding the relation of the various fossils collected and the sediments of the cave. It still remains a fact though, that the results of these so called excavations have never been published, while less is known about the techniques applied. Here, it is possible to refer to a photo (No 9.27, topographic station 136 outer Mausoleum, from east towards west, fig 7.6), taken by J. Petrocheilos (1960a), where two workers are distinguished during their effort to "explore" the sediments, certainly not with the most modern techniques. 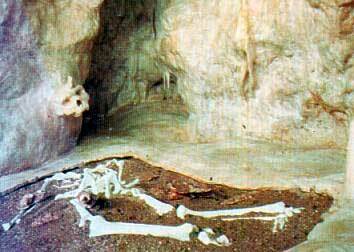 The sentence "area of finding bones" and not an excavating area is used by J. Petrocheilos (1960a) as a legend to the photograph. At the end of the same article he added: "From the offhand excavated above deposit... it is assumed that inside the cave there exist a great number of bones... Consequently, it is necessary for the I.G.U.R. to proceed excavations in the cave... To this purpose, it will be sufficient for a geologist to follow such research for ten days with the help of one or two workers". On the same issue, the most detailed description of these years' works comes from Kokkoros and Kanellis (1960): "At the inner part of the cave (fig. 7.2) and in it's lower point, red clay has been found mixed with destroyed bones. These bone fragments are usually decayed, fragile and mixed haphazardly with the clay. From such a mixture, the detachment of big bone fragments still in good shape, such as astragalusses, vertebras and teeth is easy... We also found two well - preserved bear skulls in a distance of about 18 m away from the point where many bones are concentrated inside the (inner) gallery, which is blocked by inclined soil, reaching up to the cave ceiling". In the same spirit, Kanellis (1962) affirmed: "The excavations conducted in the place where the human skull was found, as well as in other cave sites, showed that the fossil animal bones are concentrated towards one part of the cave... which can be revealed only by systematic research". Similarly, Tsoukala (1989, p. 7, 3) in her Ph.D. thesis, presented at the Thessalonica University, claims that palaeontological excavations were conducted by the above referred Professors, although Tsoukala herself (1989, p. 13, 4 and p. 342, 344) affirms that the palaeontological material studied has been collected from the cave surface (and not excavated). Obviously, this is the reason why the exact location of most of the fossils she studied, is unknown. Thus, from the bibliography, as well as from the files of the Ministry of Culture, it is evident that the University of Thessalonica never realized any systematic excavations at the Petralona cave. This was achieved later on by the anthropologist Dr. A. Poulianos, who, from the first moment the human skull was found, showed great interest, by publishing articles on Petralona (A. Poulianos 1961, 1963) and getting in contact with the Professors of the Thessalonica University, as well as with the members of the Hellenic Spelaeological Society, in order to receive a better documentation regarding the previous surface explorations. In 1965, the year of his return to Greece after a period of studies and research at the Moscow University, A. Poulianos completed his first inspection at the Petralona cave, along with the guidance of his guest Prof. Ph. Tobias. As he wrote later (A. Poulianos 1982), he had immediately suspected the existence of stratified deposits inside the cave, not referred to previously, mainly in the sector where the human skull was found, and retained disapproved the hypothesis of Kokkoros & Kanellis (1960) and Marinos et al. (1965), according to which the calvarium was transported to the Mausoleum by running waters. In the same year (1965), A. Poulianos became member of the Hellenic Anthropological Association (presidency of Prof. G. Koumaris), while he was already awarded for his doctorate thesis "The origin of the Greeks" (1962). He also got a position of scientific counsellor in the Ministry of Co-ordination and the Administrative Committee of the Patras University. The next year (1966) he was elected vice-president of the Hellenic Spelaeological Society and undertook the responsibility to project further explorations and systematic excavations of the Petralona cave. This project was delayed because of the coup d'etat of 1967 and Dr. A. Poulianos was removed from every state position. In spite of that, during the spring of 1968, he proceeded the first systematic excavation as the head of an expedition of the Hellenic Spelaeological Society. The permission was given to the Society by the local authorities (A. Poulianos 1968, 1971 and A. Petrocheilou 1972). My first contact with the Petralona cave was during this 1968 mission, helping in light tasks of the excavation and penetrating in cave fissures of reduced space, almost not accessible to an adult person. This participation was in follow of a basic spelaeological training since 1966-7 in various Greek caves (see A. Poulianos 1974). The first excavating pit has been called Section Alfa and it is dug inside the Theophrastus hall (of about 30 sq. m large and 4-6 m high), which is located to the east of the Aristotle's hall. The criteria taken into account for this hall to be excavated included the facts that: a) it is located towards the lower end of the conoid of the sediments coming from the ancient natural Pleistocene entrance and, b) its stalagmitic floor remained undisturbed by the surface explorations of the previous years. A chain of some 40 workers was used to transport, out of the cave from Section Alfa, the excavated soil in order to be washed and lead to the preservation of the remains. The excavation lasted a month and was compelled to be interrupted in an abrupt dictatorial way. Immediately A. Poulianos gave a press conference (18 and 19 of April 1968) presenting the preliminary results of his research, which were published in the journal of Archaeology (A. Poulianos 1971). Some years later (see newspaper "Apogeumatini" 29-6-1972) it became known that it was the General Director of the Greek Antiquities and President of the Athens Academy of Science, S. Marinatos who gave the order to interrupt the excavation and close the cave, using the excuse that the Poulianos' scientific work was disturbing the Archaeological Service. During the same time in the "Ellinikos Vorras" newspaper (22-6-1972), the Minister of Northern Greece, colonel N. Gantonas, declared that the research would be proceeded by the Professor of Geology J. Melentis, who had just been transferred to the Thessaloniki University and had no experience of the cave. However, the junta fell soon after (1974) and so the above Professor did not manage to execute any excavation, although later he tried in every way to get a priority on the Petralona research (see letters of Prof. R. Protsch, "Anthropos", 1983, 1986). Considering the above, it is obvious that Tsoukala's (1989, p. 7, 3) claims that Prof. J. Melentis collected fossils before the A. Poulianos excavations are inexact. In the meantime (1968/9) A. Poulianos was forced to resign from the Hellenic Spelaeological Society, after the demand of its president, A. Petrocheilou - always due to the political situation - with the excuse that otherwise the H.S.S. would be endangered. Almost contemporaneously, the Hellenic Anthropological Association (H.A.A.) was dissolved by courts using various excuses. Its council members felt the need to found anew in 1970/1 the Anthropological Association of Greece (A.A.G. ), electing Dr. A. Poulianos as its president. Curiously, after the falling of junta, using a law of rehabilitation of the dictature inconveniences, Professor J. Melentis, "re-established" under his presidency the Hellenic Anthropological Association (H.A.A.) in 1976, even though he was not anthropologist and he had not faced any persecution during the time of dictature. In 1974 A. Poulianos as president of the Anthropological Association of Greece restarted the excavations at Petralona with the permission of the Ministry of Culture, until 1983, when they were again interrupted for a second time and without been provided any excuse at all (N. Poulianos 1985). Actually, the future of the research depends on when the last Supreme Court decision (1994, 1996), which justified the Anthropological Association of Greece during its legal confrontation with the Ministries of Tourism and Culture, will be finally applied. 1974/5: Repetition of the excavation of the Section Alfa, because many data got lost during the forced interruption of the research in 1968. So, another pit was dug, the Section Alfa 2, close to the Section Alfa 1. For an easier access to the cave a gallery has been opened of about 100 m and for its microclimate protection three intermediate doors were set. Also in this gallery, a small wagon was installed, to be used in the excavations, as well as in the transportation of materials necessary for the construction of adequate corridors for the visitors inside the cave. It must be noted that, this unique construction did not damage the stalagmitic surface, because the corridors are situated above the ground and they can be willingly removed or deviated within a few days. 1976: Excavations in the Section Alfa 2, Butchering hall, Abyss 1 and Section Beta. The topographic mapping of the cave was also proceeded. The lack of water and electricity in the Petralona region during the 80's generated the major difficulties for the research. The necessary water for the excavations was transported from the Sozopolis village in special containers. In the 80's the water was obtained from an underground source, about 3 Km to the south of the cave and from a depth of about 60 - 70 m, while today it is coming from the Galarino village. 1977-83: Excavations in the above mentioned areas as well as in the Mediterranean hall, Mausoleum, Abyss-2 and 3, Sections Gamma, Delta and Epsilon. The latter has been excavated from outside the cave and in correspondence to its ancient natural entrance. During the same years the Petralona cave was opened for the public (1979). In 1981, nearby the cave entrance, the A.A.G. 's Anthropological Museum was established, here the 3rd European Anthropological Congress was held in the autumn of 1982, under the presidency of A. Poulianos. This Museum is a construction of more than 1000 sq. m and its associating buildings offer the possibility to house at least thirty researchers, since in the initial plans, the foundation of an Institute of Anthropological Research was also included. In the A.A.G. excavations the most modern methods were applied. Thus, for the first time small pieces of fossil wood were found, a leaf of Quercus and hairs incorporated inside very thin stalagmitic concretions, dated back to the Middle Pleistocene age. Also the refined elaboration of biostratigraphic data derived from these palaeoanthropological excavations served for the inter-correlation among many Eurasian sites. At this point it is appropriate to mention that, the above works were financed by the Greek Organization of Tourism with an amount of 23 million drachmas, which covered only a part of the expenses. The remaining and bigger part was covered by the A.A.G. and mainly by its president Dr. A. Poulianos (see the 289/24-2-1987 Supreme Court decision and the 25-5-1988 "ANTI" journal). 1983-1996: Interruption of the works inside the Petralona cave. Any access to the excavating area and to the material deposited in the Anthropological Museum was forbidden to the A.A.G. members. Ironically, the only worker to be fired during the same period was Christos Sariannidis who found the human skull. Also, loss and robbery of fossils and of excavating diaries occurred. Likewise, clandestine intervention in some halls and stratigraphical Sections took place (A. Poulianos & N. Poulianos, 1988). The solidarity of the European Anthropologists to the A.A.G., as much as before (Chiarelli, 1981, Bielitski et al., 1983, Gerassimova et al., 1983) and also after the second interruption of the excavations (Gray et al., 1988, Susanne et al., 1988, Henenberg, 1988), was expressed with protests and resolutions during various European Anthropological Congresses. This fact witnesses the importance and the interest of the excavations that were developed at Petralona. On the other hand, this solidarity helped the A.A.G. members to find the necessary courage to overcome many obstacles that arose by the interruption of the research, but also rendered them even more responsible towards the International Scientific Community. (Translation of the chapter excavations from the Ph.D. thesis of Nickos Poulianos “La grotta e l’uomo di Petralona”, Sept. 1995, ed. Florence Institute of Anthropology).